The eruption of a war of words between Afghanistan and Pakistan is seen as a setback to the peace process between the government of Afghanistan and the Taliban. Though it was Afghanistan which took the lead on this with president Ashraf Ghani accusing Pakistan of sending out “messages of war”, the Afghans can hardly be blamed for the breakdown. This year has been the worst year for civilian causalities in Afghanistan since the United Nations started tracking them. Afghan security forces have also suffered huge casualties with over 4300 dead and 8000 injured since January. But what really upset president Ghani was a string of attacks in Kabul, three on Friday August 7th that led to over 50 deaths and one on August 10th at the entrance of Kabul airport that killed five persons. This spike in violence in fact immediately followed the first publicly acknowledged talks between the two sides at Murree. With public sentiments across Afghanistan running high against Pakistan’s perceived duplicity, Ashraf Ghani had no option left but to blame Pakistan. President Ghani has been under pressure for his controversial outreach to the Pakistan army, and meeting with General Raheel Sharif at the army headquarters, even before he met prime minister Nawaz Sharif. This was the beginning, and since then, Ghani has effectively given up all his cards. He withdrew his predecessor’s request to India for security assistance, handed over TTP leader Latifullah Mesud to Pakistan, sent Afghan army officers to Pakistan army’s training schools, allowed close interactions between corps commanders of the two armies and overruling objections of his intelligence chief, agreed on an intelligence sharing agreement between the ISI and Afghan NDS. Though criticised within Afghanistan for his naiveté in thinking that Pakistan would deliver on peace, Ghani understood that there could be no peace in Afghanistan without the Pakistan army on board. The Taliban would not have become a fighting force post-2001 without the army’s active support, including continued sanctuaries, funds flow, training, and arms & ammunition. Hence, bringing the Pakistan army on board seemed the only way out. According to Rakesh Sood, India’s former ambassador to Afghanistan, president Ghani’s motivation in reaching out to the Pakistan army was not really to get them to deliver on peace talks with the Taliban, which would only be symbolic, but to establish a cooperative relation with the army. The question then is why did this outreach not work? Why is Afghanistan not seeing any peace dividend, and why have levels of violence gone up? First, a democratic, plural, independent Afghan State poses an existential threat to the Pakistan army. For one, an independent Afghan State would not be a puppet or allow its soil to be used as a safe haven for terrorists. India has no designs on Afghanistan, and its development and humanitarian assistance is meant to facilitate the stabilisation of Afghanistan. A plural, democratic Afghanistan would pose a ‘threat’ to the “garrison state” that the army has turned Pakistan into. Its bogey about its fears of being encircled by an India-Afghanistan axis is meant to divert attention from Pakistan army’s real intentions and fears over a loss of control over the ‘State’ of Pakistan. On the other hand, an Afghanistan on ferment, suits the Pakistan army’s corporate interests. Further, Afghanistan maintained its neutrality during both the 1965 and 1971 wars, and there is no evidence that India-Afghanistan relations have any third country in the calculus. Second, the Pakistan army had no intentions of giving up its strategic assets and gains. This was even after India is seen as almost completely marginalised in Afghanistan. 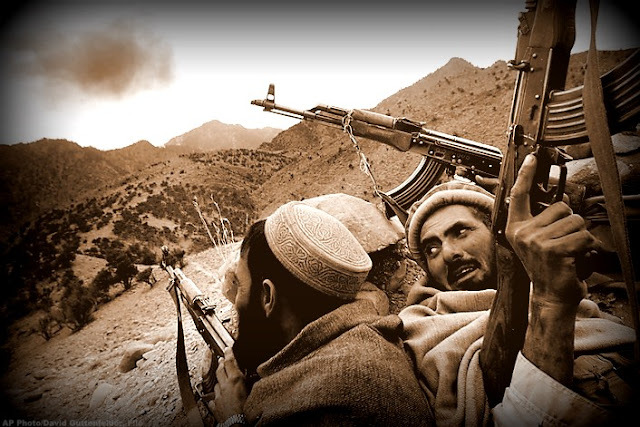 Asymmetric warfare using jihadi terrorists as proxies is the Pakistan army’s weapon of choice against both India and Afghanistan, and central to its strategic doctrine. The Pakistan army first used it as early as 1947, in Kashmir, predating Zia by decades. In 1965, they again used it in Kashmir prior to launching a formal attack. Bhutto armed Afghan Jamaiti youth firebrands like Ahmad Shah Masood and Hekmatyar to launch an insurgency in Afghanistan in 1973-74; Pakistan armed Khalistani terrorists in the 1980s and sent Jihadis into Kashmir from 1989 once they were not needed in Afghanistan. Their record in Afghanistan after the Soviet invasion is no better. First, as the sole channel for supply of assistance, including arms & ammunition to different Afghan jihadi groups, then choosing Hekmatyar as their favourite, discarding him for Taliban when he could not deliver, and re-creating a neo-Taliban 2004 onwards, so that they regain control over the Afghan affairs. Therefore, agreeing with Ghani in an attempt to bring peace was only tactical – the intention was to discredit Ghani and the Afghan State by his failure to bring peace or even improve the situation. And implicitly, expose America’s limitations by showing that it would not come to Afghanistan’s rescue even as the Afghan State crumbles. Sidelining India was part of this game plan. Third, despite creating and nurturing the Taliban, the Pakistan army cannot control them. There have been reports that the Taliban leadership and their families are kept in “protective custody” in Pakistan lest they act independently. Mullah Baradar, erstwhile Taliban number 2, reportedly with Mullah Omar’s permission, responded to President Karzai’s overture, only to be jailed and made incommunicado. The message was clear – Afghans could talk to Afghans only via Pakistan army. Baradar’s predecessor, Mullah Obaidullah, was killed in Pakistani custody. The refusal to allow the Taliban’s Doha office any role in the negotiations with the government of Afghanistan since they could act independently is another sign of Pakistan’s inability to fully control the Taliban. Observers were surprised that sections of the Taliban leadership opposed the Pakistan-China sponsored peace talks. In desperation, Pakistan tried to use Mullah Omar’s imprimatur to give credibility to the talks. This proved the last straw since the insiders knew that Mullah Omar had died in early 2013 in Karachi. And once his death became public, the wrangle over Taliban leadership became public and Mullah Mansour has had a tough time asserting his authority as the new Amir ul Momineen, despite Al Qaeda leader Ayman Zawahari’s swearing a personal oath of loyalty (bayat). The naming of Pakistan army’s favourite, Sirajuddin Haqqani as Taliban deputy leader though he has his own network showed that things were not under control. The fact that the death had to be kept a secret, (otherwise the insurgency would splinter) makes any possibility of a peace deal with the Taliban dubious. The danger is that more and more jihadi groups created by the Pakistan army to serve its domestic and external ends may loosen their apron strings, step up their violent and terrorist act that could pose a serious existential threat to the Pakistani State. The US withdrawal from Afghanistan has opened the doors for China to become involved in Afghan affairs. Over 14 years, China has been more or less free-riding on American security cover, with its contracting firms active commercially. China’s official assistance remains at low levels, in the region of US$ 150 million. Recently they have handed over 300 tractors worth US$ 8.5 million, committing to send its experts to work along with Afghan farmers. It has also agreed to supply small arms to Afghan security forces. President Ashraf Ghani's outreach to China, even before going to Pakistan, surprised many analysts. It portrayed that he understood that despite the billions pumped in by the Americans into Pakistan, including direct support to the army, it is the Chinese who are seen in Pakistan as a reliable, all-weather friend. Only the Chinese have leverage over the Pakistan army, its one genuine strategic ally. successful Taliban takeover of Afghanistan could have serious consequences for Pakistan. (China seems much less concerned about the impact of such takeover in Xinjiang and elsewhere in China. In any case, the dominant strain in Uighur nationalism is not Islam though small groups of Uighur jihadis have been trained in Pakistan.) Hence China is a natural stakeholder in the Afghan peace process once American largesse and troops became history. China has developed contacts with sections of the Taliban, presumably the more pro-Pakistan ones, and in recent past hosted Taliban delegations, as precursor to the latter’s direct talks with the Afghan government. The presence of Chinese and American observers in the Murree meeting demonstrated that the two countries are the most important external stakeholders in Pakistan, they enjoy unprecedented influence in its strategic space, and are on the same page in seeking peace and stability in the Af-Pak region. Though unsaid, an unstable Afghanistan with competing areas of influence is less of a problem than an unstable Pakistan – with the army forced to turn its guns on jihadi forces that it has itself spawned as a strategic instrument of state power. Even as the Pakistan army operates against selective groups of jihadis in FATA, in Karachi and even in Punjab, it refuses to give up its perceived “strategic assets”, believing it to be its only card against the growing economic and political clout of India. After resisting for years, China finally agreed to drop its objection to India becoming a member of the Shanghai Cooperation Organisation (SCO), a grouping of Central Asian ‘stans’ (minus Turkmenistan), Russia and China. China’s price was the simultaneous entry into the organisation of Pakistan. Initially focused on counter-narcotics and anti-terrorism, the SCO has now broadened into regional economic cooperation. China with its US$ 50 billion in investments in infrastructure (pipelines, roads, railways, energy etc.) in Central Asia, Road Belt project, new institutions such as the Asian Infrastructure Investment Bank & New Development Bank etc., has moved beyond SCO. It sees the latter more as an institution to facilitate greater connectivity through confidence-building, regional economic cooperation etc. The China Pakistan Economic Corridor (CPEC) must also be seen in the same light of giving Pakistan a stake in broader regional economic growth, taking advantage of China’s need for access to the Arabian Sea bypassing Malacca, and China’s interest in stabilizing Pakistan. China, and the US realize that the dominant narrative in Pakistan has to change if that country has to stabilize and grow. The US lacks the capacity, staying power and credibility to do so, with Hillary Clinton’s New Silk Road emphasizing on East-West connectivity failing get traction in Pakistan. CPEC to be successful, needs a stable Afghanistan and normalization of India-Pakistan links to achieve its potential. With China as its sponsor, it has a chance of success but its starting point is a Pakistan establishment that has moved out of its jihadi mindset, discarding its need to keep Afghanistan unsettled or ‘bleed’ India ‘by a thousand cuts’. But would the establishment go along, as it would mean a weakening of the garrison state? The continued existence of camps of the East Turkestan Islamic Movement in Pakistan is not a good omen. Shakti Sinha is the Director of South Asian Institute for Strategic Affairs. He writes on public policy and strategic issues.